Stark VPN v4.0 has been pushed to Playstore for you to update. The latest update has been out for days now and as usual, the update fixes some minor bugs including the famous Etisalat free browsing cheat that stopped connecting in previous version of Stark VPN. As we all know, Stark VPN is a free vpn application that came with pre-installed free browsing packs as well as free servers for you to use. But ads pop ups is still available in this new version (that's just the token to pay for using a free vpn application) unlike Tweakware that disabled ads on premium users, while ads is visible when you are a free user connecting with free servers. If you are an old reader of this blog (entclass.com.ng) i guess you should know how to setup this cheat on Etisalat and Glo, because they are the only working free browsing cheats working on Stark vpn currently. On the offchance that you are a new visitor on this blog Entclass.com.ng i urge you to check our previous posts on how to set up Etisalat and Glo free browsing cheats on Stark VPN. >> Stark VPN is a free and simple vpn application. WHERE TO DOWNLOAD LATEST STARK VPN? If you are confused in any way, don't hesitate to comment below, I'm always here to help you get online. Oops.... I will quickly find my etisalat.... I hope the mb is not capped @ kashi? pls help! glo ucmini tweak is no more downloading. Solutions are appreciated! somebody help! 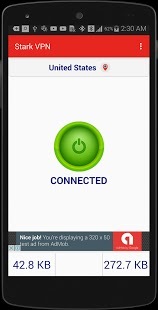 glo ucmini tweak no longer browse & download. pls provide working sokution. tanx! So I finally downloaded this. Etisalat no work. Even the glo no connect. I think I will soon delete it again. Tweakware and anonytun is enough VPN on one phone. mine is saying "connection failed"